The fourth season of Deep Space Nine marks a bold shift in tone and direction, with the arrival of Worf, a stronger emphasis on the Dominion threat, and a vivid focus on the Klingons. The season opens with a feature-length premiere that pits the Klingons and Federation against each other, presenting war between the two races for the first time in decades. As a result, Dukat’s relationship with the station becomes less adversarial – for the moment – while the Cardassians aid in the war against the Klingons. New dimensions are presented for this primary antagonist, with layers of comedy, humility, and love added to this highly complex character as he sees a fall from grace following the discovery of his half-Bajoran daughter. The season introduces several recurring characters that will appear through the remainder of the show’s run, including Leeta, General Martok, Weyoun, Liquidator Brunt, and Sisko’s father. When a freak accident traps Sisko in a time paradox, only re-appearing every few years, Jake spends the remainder of his life trying to save him. Unbeknownst to Kira, Dukat has a secret agenda when he offers to assist rescue survivors of The Ravinok. Jadzia fights temptation when she is reunited with the new host of Torias Dax’s widowed wife. Upon rescuing an alien ship, The Defiant is badly crippled by the Jem'Hadar and becomes trapped in a gas atmosphere. Quark, Rom, and Nog accidentally transport themselves back to the Roswell Incident on Earth in 1947. Worf and Jadzie set out with the legendary Kor to find the ancient bat'leth of Kahless. Jake tags along when Sisko and Odo head to Earth to shore up defenses against a likely Changeling invasion. Kira assists Gul Dukat, now in command of a freighter, to stop a Klingon Bird-of-Prey that destroyed an outpost with a joint Bajoran and Cardassian delegation. Worf's disgraced brother comes to DS9 seeking an honorable death. Quark’s frustrated employees organize a union and strike, prompting intervention from Liquidator Brunt of the Ferengi Commerce Authority. Miles struggles re-adjusting to normal life after having the realistic memories of serving a long, difficult prison sentence transplanted into his mind. 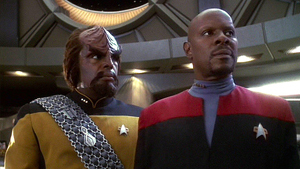 Sisko's loyalties are tested when his girlfriend, Kassidy Yates, is an accused Maquis collaborator. Sisko and crew assist Weyoun track down a renegade Jem'Hadar group who have located an Iconian gateway. When Odo is struck with an unknown illness, Sisko seeks help from The Founders, who enact a punishment against Odo for harming another Changeling.